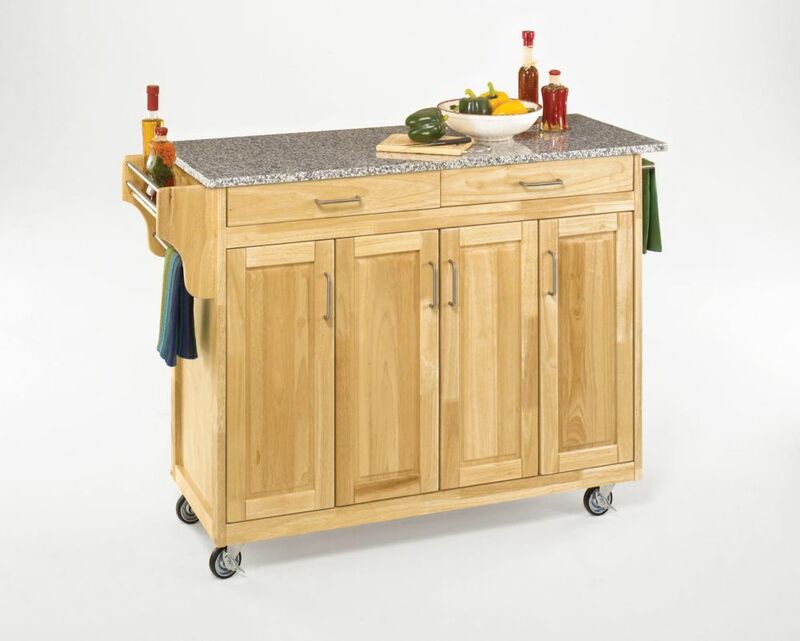 Home Styles Create-a-cart in a cherry finish with a wood top features solid wood construction, and 4-Utility drawers; 2 cabinet doors open to storage w/adjustable shelf inside; Handy spice rack with Towel bar; Paper Towel holder; Heavy duty locking rubber casters for easy mobility & safety. Size: 48w 17.75d 35.5h. Create-a-Cart Natural Finish SP Granite Top is rated 3.9 out of 5 by 18. Rated 4 out of 5 by BigKriss from Ordered and had shipped to the store. Received the cart undamaged. Cart went together easy, havin... Ordered and had shipped to the store. Received the cart undamaged. Cart went together easy, having an extra set of hands definitely helps. Quality is good, but top drawers are very shallow. Good use some updated "slow close" hardware. Overall a great cart for our needs. Rated 3 out of 5 by Laura from The cart went together very nicely. We did need to... The cart went together very nicely. We did need to add a little support for the drawers to keep the rollers on track. Unfortunately, the granite top was broken. I’ve read others have had the granite broken in transportation. That is a weak point that should be addressed. Rated 4 out of 5 by Bob from This is a very well built product. Made of solid wood, not plywood or fiber board. We purchased ... This is a very well built product. Made of solid wood, not plywood or fiber board. We purchased the unit with the granite top and were more than pleased. The reason for four stars instead of five, the top interfered with the drawers. Everything else fit perfectly. The solution to this problem was adding 1/8 inch shims between the cabinet and the top. The look and finish are beautiful. Rated 1 out of 5 by Pete from Ordered and rec'd the cart which was nice. Made the mistake of putting the cart together before o... Ordered and rec'd the cart which was nice. Made the mistake of putting the cart together before opening the granite top which had a huge chip and was broken into four pieces, very upsetting. Called the Home Styles number and was told they couldn't send just send a replacement granite top, had to un-assemble the unit and take it back to Home Depot, get a refund and reorder!! The granite is not a light piece, even the UPS guy struggled with it. Very disappointed, if you do order the cart be sure to open the granite box first to make sure it's in one piece. Rated 5 out of 5 by Paul from well worth the money, I would recommend this product. ... well worth the money, I would recommend this product. Rated 5 out of 5 by Samantha from Love it. Nice size. Moves well. Easy to setup.... Love it. Nice size. Moves well. Easy to setup.